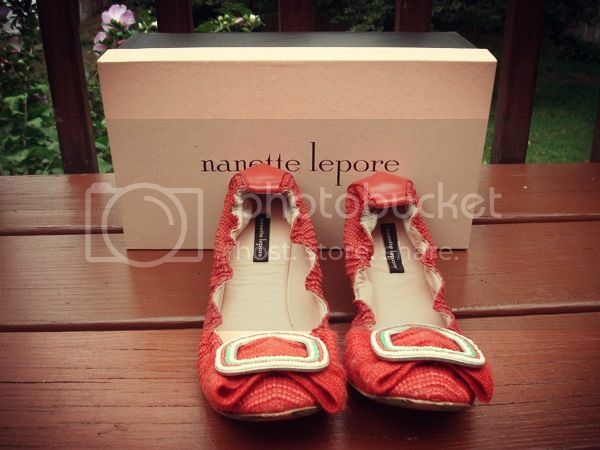 Bright in color, these coral straw Nanette Lepore ballet flats are great for those days when your feet need a break from the sometimes torturous heels we love to wear. They're also perfect for traveling in your daily bag for easy switch over at the end of a long day. Although a size 9, these will fit a size 7--sizing on these shoes were completely miss measured. Although worn approximately 3-4 times, these are in great condition. Retailed for $225 but I'm letting these go for only $10 with original box included.